On a February night in 1986, the Swedish Prime Minister and his wife were walking home, without bodyguard protection, after seeing a film at a cinema when a lone gunman appeared. Olof Palme was fatally wounded and at the time of writing, no one has been successfully convicted for his assassination. To coincide with the twenty-seventh anniversary of Palme’s murder Swedish police launched a helpline that members of the public could phone if they had any information which would help in the ongoing criminal investigation. Early estimates suggest that at least a hundred calls were made and some new facts were presented to the police but it remains too soon to state with any certainty if this will result in any arrests being made. Without an arrest or a known motive, a plethora of conspiracy theories about who was responsible for the killing have been discussed, analysed, and contested in ordinary day-to-day conversation and within books, films, radio, and TV programming. Adding to the debate of possible institutional complicity is SVT’s 2013 adaptation of Leif G. W. Persson’s trilogy; Between Summer’s Longing and Winter’s Cold, Another Time, Another Life, and Falling Freely, as in a Dream. Starring Rolf Lassgård, En pilgrims död is a four part mini-series directed by Kristian Petri and Kristoffer Nyholm from a screenplay by Sara Heldt and Johan Widerberg. The series is set within two time periods; 1985 and the present day. Following an informal discussion with a superior officer, Lars Martin Johansson ( Rolf Lassgård) sets up an informal investigation into Palme’s murder that runs parallel to, but is independent from, the official investigation. Johansson’s largely self-imposed parameters are to explore the historical documents within the police archive to assess if all data was recorded and interpreted correctly and to see if his own personal inaction may have inadvertently led to Palme’s death or the killer being able to evade justice. The police service of 1985 is riddled with corruption and fascist sympathisers. From top to bottom the force is tainted by the stench of improper activities. With no checks or balances, the police can act as they please and frequently do just so long as the thin veneer of public respectability is maintained. Rumours about senior colleagues once heard are denied and false alibis are constructed for officers suspected of illegal activity. Johansson might be good at his job but he commands very little respect from his colleagues, his sociopathic approach to interrogating suspects is used to make the viewers aware of how very different modern police methods are from those employed in the 1980s; an early scene features Johansson tormenting a suspect by supplying him with details of his father’s death. 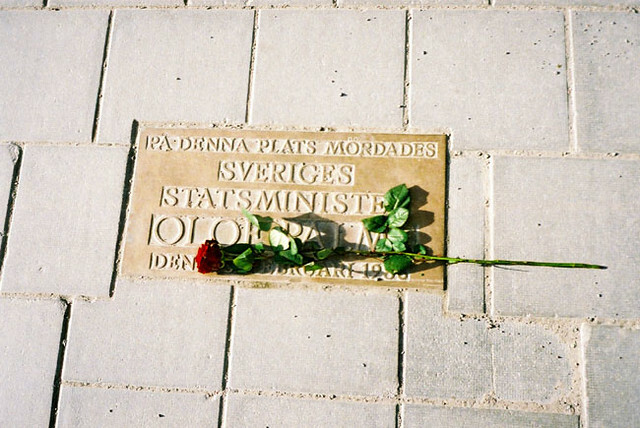 As the months fly away and we head towards that tragic night upon which Olof Palme died we, as viewers, are passive observers to a police force so paranoid that the Prime Minister may be a covert Soviet Agent that it will commit murder in order to obtain a manuscript which may confirm its fears. Despite some minor anachronisms, specifically with regards 1980s male fashions this series succeeds in selling the era to the viewer and resists the all too obvious temptation to dress the cast in pastel suits and espadrilles whilst a soundtrack of Nik Kershaw and Frankie Goes to Hollywood ramps up the action. The period clothing is very somber and the kitsch cultural references are reserved for the present day sequences. Demis Roussos’ Forever and Ever is used specifically as an ironic counterpoint to a particular moment of the story which adds a new layer of meaning to the track in a manner reminiscent to how Lynch employed Roy Orbison’s In Dreams within the movie Blue Velvet. This is an exceedingly well-made series. Prior knowledge of Swedish political history is not a prerequisite for viewing, all the relevant information is relayed wherever it is necessary for an understanding of the plot and the use of appropriate archive material enhances the sense of verisimilitude. After several episodes containing discussion about Palme both as a man and a politician the moment when the assassination happens is far more emotionally potent than I had anticipated and in addition to forcing me to continue watching on the edge of my seat to see what conclusions the series would make it also led to me being actively interested in reading about this period in Swedish history. Death of a Pilgrim is available to order from Amazon. Thank you for a great piece. I am Swedish and was very influenced by Palme as a teenager. Just a quick note to say that Mr Palme’s first name was Olof and not Olaf. In the movie, what happened to Waltin? Does he return in The Fourth Man? In the movie it seemed as if all the players were brought to justice then I realised Waltin got out of town. Does he come back in the next series, The Fourth Man?